Llama!!! A friend of mine used to have alpacas - which I suppose is like being a short llama - and I just loved them. Nothing is cuter than a baby one either. I can't say they smell just really nice because they don't and they also spit, but they're still cuties. It's a little different when they come to you for a hug and then spit in your face. Uck! Anyway, this set of stamps is from Newton's Nook. It really can be used for either Christmas or a birthday I think. In fact, I used it for a birthday card not long ago. I paired this with some red and white gingham paper and baker's twine. I'll take this festive Christmas card over to Rudolf's Day challenge. I have been eyeballing this adorable Llama set! This card just gives me the giggles! Love it! This is gorgeous and love the gingham which showcases the image beautifully. Adorable card Lynn, fabulous colouring and even if these guys do spit, you gotta still love them.. The gingham background strip is perfect here with this very fun llama. I don't think I would like to be spit on either! But the llamas are so very cute to look at. I like the nice bright colours on the Llama! Oh what a fun card Lynn! 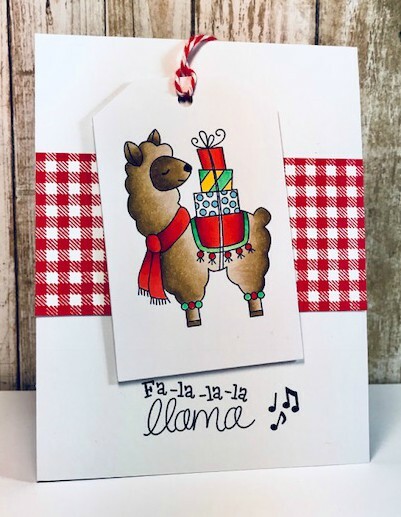 I love that llama image and you've colored it beautifully, love the gingham paper too! What a super fun card, love the image and sentiment. The single strip of gingham dsp is all this silly llama needed! Expert coloring on this image too and that sentiment is just too cute and fun :) Love this card for any occasion! Oh Lynn, how I love this card! The image is so fun and colored so beautifully and skillfully! We met some Llamas at a farm next to my Aunt's home- I do not remember any of them spitting- I think I would remember that- and not too fondly! LOL Great card- love the sentiment as well. You have the most adorable images, this one is colored superbly and I LOVE it against the red gingham border. I'd totally forgotten Rudy Day until I started to return some visits, and saw Rudy Day cards. Love this one! TFS & Happy Easter. What a cute little llama on your lovely card ! What a fun Christmas card, Lynn! I LOVE this llama and that red gingham! Looks like he'd do very well for a birthday card too. OoOh this makes me smile....has me singing along!!! Such a crisp and stylish card and adorable too!!! YOu nailed it! I love this! What a sweet image and sentiment! How cute is this gift-bearing llama!! What a fabulous holiday design, Lynn!